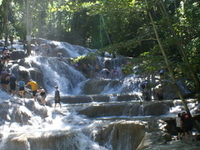 Travelers are voting Dunn's River Falls, National Heroes Park and Dolphin Cove as the best of 4 picnic spots in Jamaica. Also popular is Ras Natango Gallery and Garden in Kingston. Want more? Check out our map of picnic spots in Jamaica or these 2 picnic spots near Ocho Rios Ann. Dolphin Cove Jamaica is a marine attraction located in the western Caribbean island of Jamaica.